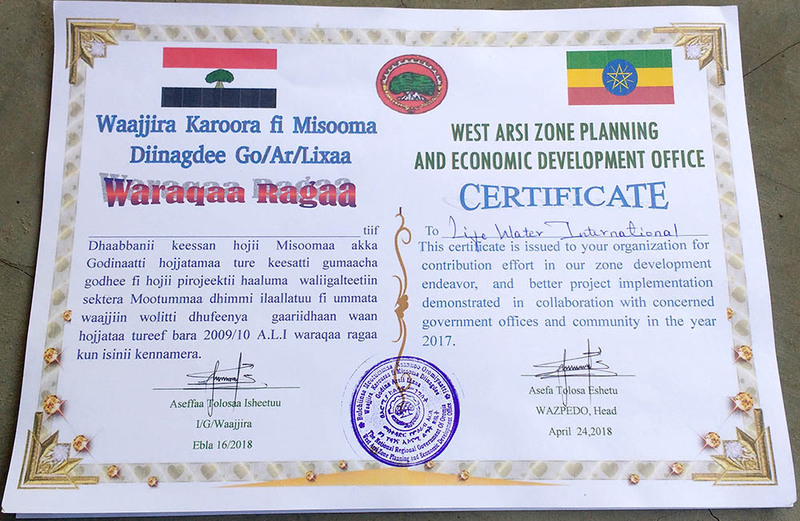 ADDIS ABABA, ET., April 24, 2018 — Lifewater’s West Arsi team is honored with a certificate of merit from the government zonal office in Ethiopia. The award recognizes that Lifewater is among the top five National Government Organizations (NGO) of the 58 organizations working in the region. The nonprofit met eight major levels of criteria to receive this acknowledgment; those criteria include excellence in conducting need assessments, an intentional and thriving government partnership, and quality of workshops among many more. This is the second certificate of excellence that Lifewater has received for their work in this region. They were honored for their enduring commitment to the community in a small ceremony. It confirms that the nonprofit effectively delivers on their plans for the West Arsi region in terms of both quantity and quality, and meets or exceeds the standards of transparency, efficiency and participation that the government deems optimal for NGO’s in the area. Lifewater is honored to have received this acknowledgment. To see the quality work happening in West Arsi, visit our live maps.